LaunchOnTime is a utility for opening files and apps or running AppleScripts at specified times. Drag and drop files or use the "Browse..." button to add files to the list. 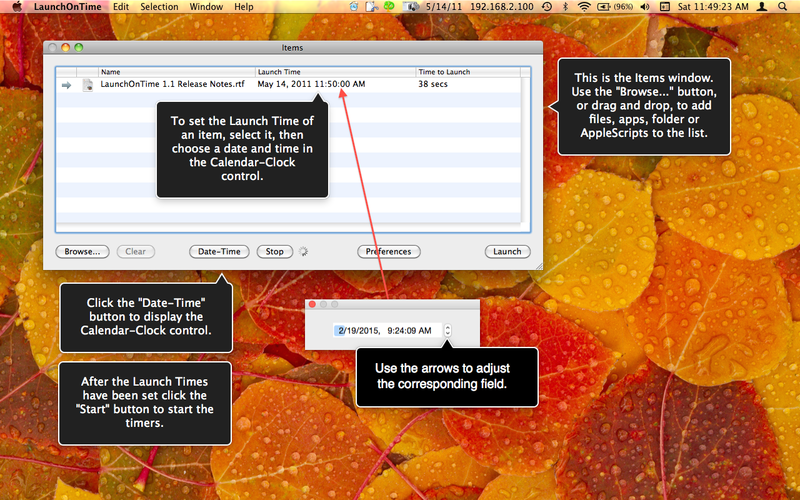 Then select one or more items and use the "Date-Time" selector to schedule their launch date and time. Click the "Start" button to start the timers that will execute the launching of the items. The "countdown" column displays the time remaining until launch of each item. If the file is an AppleScript it will be executed, with its script result optionally email to you, otherwise the file or app will be opened in the default application for the type of file. Various options are available using the Preferences window, such as setting the option to repeat the schedule periodically. LaunchOnTime will wake up a sleeping computer prior to a launch time if you run it as "root user." To do so you can use our app LaunchAsRoot, that launches apps with root privileges, or any other similar means. Sample usage of LaunchOnTime: LaunchOnTime was actually conceived as a means of managing the scheduling of email blasting from our app Mailings: Mailings has the ability to commence a mailing automatically when a saved Mailings document is opened.